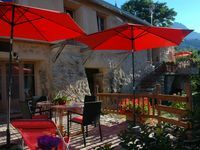 Property 6: GITE NEW T3 "DOORS QUEYRAS"
Property 7: Home Quality Comfort for You and with You for a great holiday! Property 17: SUPER Gîte at the foot of DEVOLUY: PROMO from s6 April to m31 April = 450 € / week! GITE SPACIOUS AND LARGE TERRACE WITH VIEW. Property 23: GITE SPACIOUS AND LARGE TERRACE WITH VIEW. Property 31: Independent unusual cottage, quiet, countryside in kind, 2 people. Property 43: average mountain cottage, quiet and rest assured. Property 47: Independente house, countryside, tranquility, nature.